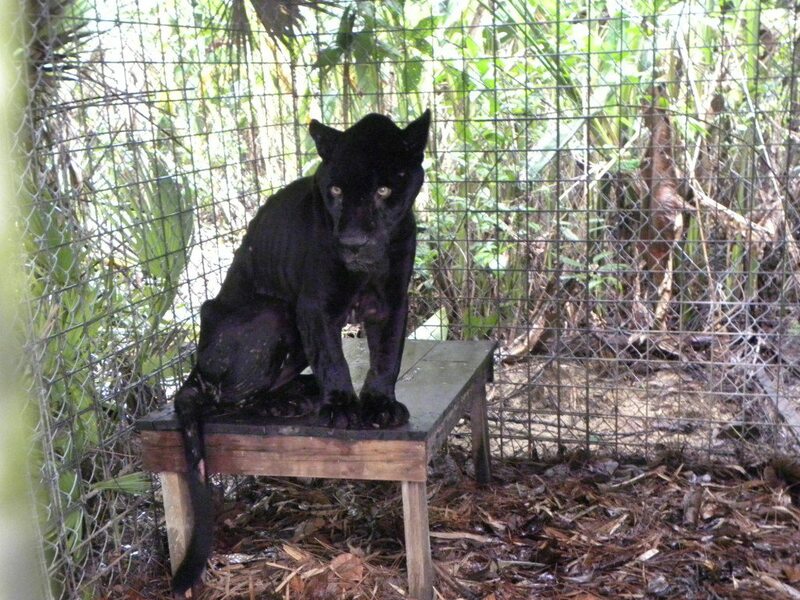 The sad story of Bosch, the emaciated black jaguar that had been found starving and left abandoned at the Ballum Na Lodge in Punta Gorda has taken a happy turn after the heroic and caring efforts of a coalition of environmental organizations that came to his rescue and are now helping him to recuperate. Hearts were saddened and angered when word came out of the jaguar that had been left for dead in a cage after irrational and possibly illegal circumstances led to those who were responsible for his care abandoning him without concern for his wellbeing or safety. It was only after Wil Maheia, a member of the Belize Wildlife Conservation Network, alerted everyone to the jaguar’s plight that Bosch’s condition became known. 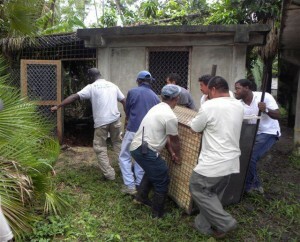 Immediately, a coordinated and dedicated team consisting of the Belize Zoo, the Belize Wildlife Conservation Network, and the Belize Forest Department came together to provide food, vitamins and supplements to prevent further deterioration in Bosch’s condition and help to keep him alive until a proper veterinary assessment could be conducted. On July 20th, rangers and volunteers from the Belize Zoo and the Forest Department successfully rescued Bosch and transferred him to his new home and the Zoo. Bosch, who has been fondly renamed ‘Lucky Boy’ is now living comfortably at the Belize Zoo under the cautious and attentive hands of qualified and caring professionals who are slowly nursing him back to full health and providing the necessary love and attention he deserves. On the Belize Zoo’s Facebook Page they’ve commented that “Lucky Boy's eating like a champ, and interacting enthusiastically with his caregivers. A surprisingly calm and easy going jaguar, a special diet and tender love and care are all he wanted. He's definitely on his way back to being healthy and beautiful once more.” Lucky Boy is believed to be about 11 – 12 years old and according to the Zoo originated from Xcaret Zoo in Mexico. The Zoo keepers say that although it will take a number of months for Lucky Boy a.k.a. Bosch to make a full recovery and come back to full health they do believe that he will certainly return to his full majesty and beauty over time. At this point it is uncertain exactly just how many people will be charged for the crimes of negligence and neglect that led to the jaguar’s severe health and condition, however, representatives from the Forest Department and Wildlife Conservation Network have indicated that they are seeking charges against the owner of the lodge, and anyone who played a role in allowing Lucky Boy to deteriorate to the state he had been in will be held accountable to the full extent. Forest Officer in the Wildlife and Law Program of the Belize Forest Department, Rasheda M. Garcia, has stated that "the animals were clearly neglected and the responsibility for their care and management squarely falls on the owner of the lodge. Therefore the department holds him responsible and will be pressing charges against him." According to as yet unconfirmed reports, the lodge, which is actually a group of several different jungle and island lodges on more than 13,000 acres in Toledo, is believed to never have been successful as a tourism business. Allegations are that the establishment recently ran into financial problems and reportedly let most of its employees go, with the jaguars and other animals, including monkeys and birds, apparently left unattended and in captivity. There have also been reports that at least 28 employees of the lodge from Indian Creek village, along with employees from other Maya villages in the area have said that they had not been paid by the lodge in from two months to as much as a year. Belize Lodge and Excursions has an address in Washington, DC that appears to be a drop box at a law firm. Apparently the lodge had permits to keep the jaguars at the lodge, which they claim were born in captivity, however this raises some questions as to what permits were in hand to allow them to keep jaguars on site since the pet permit application available for download at the Belize Forestry Department’s very own website clearly states that Jaguars fall under ‘Category 2: Felines’ of “Animals that cannot be held as pets”, along with other felines which are the Mountain Lions a.k.a. Pumas or Cougars, Ocelots, Margays and Jaguarundi. Not surprisingly the company website has since been taken down. The San Pedro Sun will follow the developments of this story and provide further details about those responsible and any charges that would come as a result of the complete and utter neglect of Lucky Boy and the other animals that they were to be taking care of. You can follow Lucky Boy’s progress on the Belize Zoo’s Facebook Page as they have promised to regularly post updates and photos of his recovery and progress on his way back to full health.